"I think the best thing about a community garden is the word community." Karen Washington gets her hands in the dirt more than most born-and-bred New Yorkers. 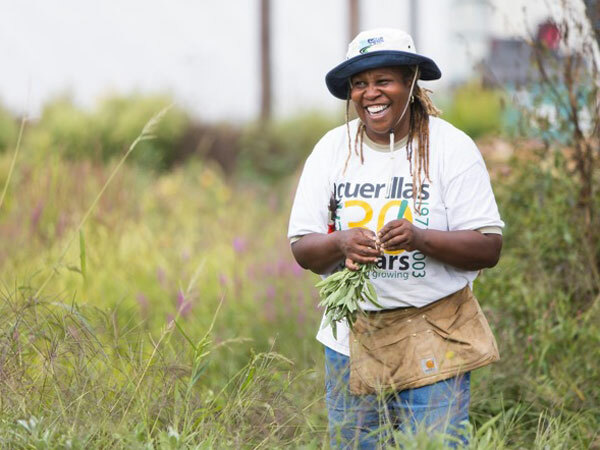 She has spent the past three decades working in urban gardens and teaching others to do the same in order to create access to fresh food. She is the cofounder of Black Urban Growers, was named one of the 100 most influential African-Americans in the country by Ebony, and was the recipient of a James Beard Foundation Leadership Award. We spoke the morning after the block party celebrating the 30th anniversary of the Garden of Happiness, the community garden she helped start in the vacant lot across from her home. —Interview by Julia Turshen, founder of Equity At The Table (EATT) and author of Now & Again. JT: You were a physical therapist before you were a community gardener. How did you begin to amplify your therapy work with community gardening? KW: I was a physical therapist for 37 and a half years, and so many of my patients were diagnosed with diet-related diseases. A lot of it had to do with the food they were eating. I would call myself a holistic therapist. I would look into their refrigerators and their cupboards. I found myself unable to treat them if we didn’t work on their diet. JT: Who taught you about gardening? KW: Books. Thirty years ago the internet wasn’t so big. JT: Did you see anyone who looked like you in those books? KW: No! No! [laughs] What struck me about that in retrospect is that people were getting more into holistic farming and biodynamic farming and encouraging diversity in what they were planting, but not when it came to the farmers themselves. We still have a long way to go. JT: You talk a lot about looking beyond raised beds. What do you mean by that? KW: You have to look beyond where you are, especially when it comes to community. One of the major challenges we have in terms of lack of diversity is that people are afraid to get out of their own comfort zone. You become complacent when everyone around you looks the same. If your intention is about growing food and the importance of the food system being diverse, and we have problems around hunger and poverty, you have to make it your point to get uncomfortable, to be uncomfortable. Look around and outside of the raised bed, and ask: Who is missing, and who needs to be heard? JT: With that in mind, how do you see the role now of community gardens? KW: I think the best thing about a community garden is the word “community.” You don’t have to speak the same language to know what it means when someone puts food down on the table for you. JT: What continues to get you out of bed everyday and continue the work, even though you’re technically retired now? KW: I’m cognizant that life is a gift, and I want to make the most of it. I wake up energized and thankful for little things. For the fact that the sun comes up. For the trees. For the rain. Sometimes when I’m in the city in the hustle and bustle, I have to stop and look up at the sky. As a physical therapist, I have seen so many disabilities and how in a second your life can change. It’s taught me to be thankful for little things.